Georgia Dunn Studio: The Twelve Days of Halloween: Day Four, Vincent Price! 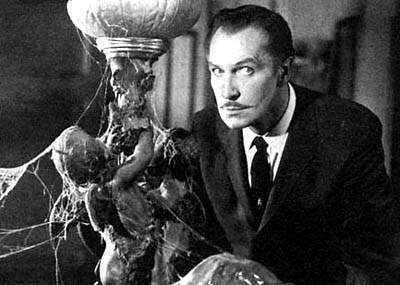 The Twelve Days of Halloween: Day Four, Vincent Price! I can't think of a cute lyric to divide Vincent Price into four parts, so I won't try. It's the fourth day of Halloween, and at this late hour in the last remaining moments before midnight I want to devote this day to Vincent Price! Someone forgot to dust the lamp! It wouldn't be Halloween without scary movies, and so many scary movies would not be their eerie selves without Vincent Price. His piercing eyes, his intensity, and--of course--his voice all lent a subtle creepiness to the silver screen. He found a niche in B movie horror, and no one has been able to hold a cobwebbed candelabra to him since. His voice is the pop culture heebie jeebies in vocal form. What would Thriller be without his dark sermon monologue and laughter croaking like an opening grave at the end? As frightening as Price could be, whether he was playing every crazy girl you've ever met in 'The Fall of the House of Usher' or getting to the bottom of strangeness in 'The Fly', he also had a sweet charm about him. The following video clip of Price and Kermit the Frog is especially adorable. Sadly Vincent Price passed away in 1993 while showing Edward Scissorhands a new pair of hands. However, he lives on in the shadows, waiting around every corner, especially when you walk out alone to the kitchen in the middle of the night. If you're lucky they say you can still hear him on the wind on a dark and mournful eve. A Bedroom and a British Bunny!